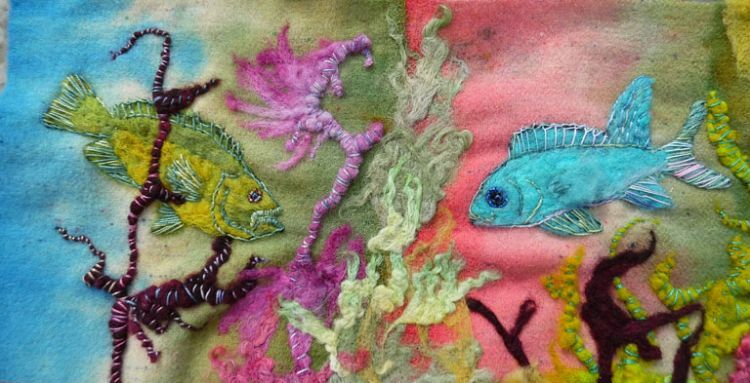 My exploration of felted applique technique, brings out my sense of humor with Woolly Fish. This is the first time we had our pattern cover printed on 11" x 17" paper. It will fit nicely in a 12" x 9" zip lock bag with the 8 pages of instructions and large paper for the drawings for the appliques. 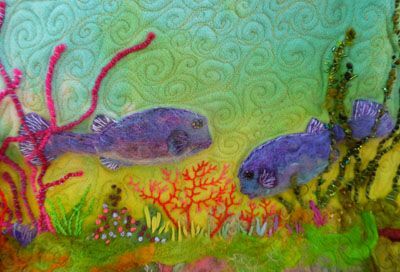 I used the Tropical Fish pattern (also listed on this site)I designed in 1990 for the drawings of this felted wool applique pattern. The layout is simpler because there are only four background strips, but the details are more intricate. 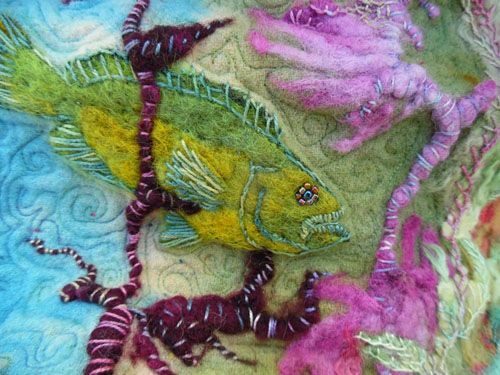 Each fish is an applique cut out of wool. The appliques are then poked in place with the felting tool to temporarily tack them in place. The color of the applique doesn't matter since it is covered by the next step: poking the appliques with wool rovings (fibers). The felting tool I use, has 3 close together barbed needles. 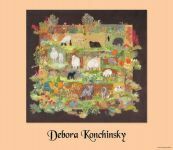 You poke the fibers into the appliques with the tool and all the fibers in the appliques and the backgrounds get hooked together, creating felt. The pectoral fins can be 3-D, but felting the fibers by themselves, turning them over again and again while you poke them. When the resulting fabric can't be pulled apart, you can use scissors to cut them into the proper shape. 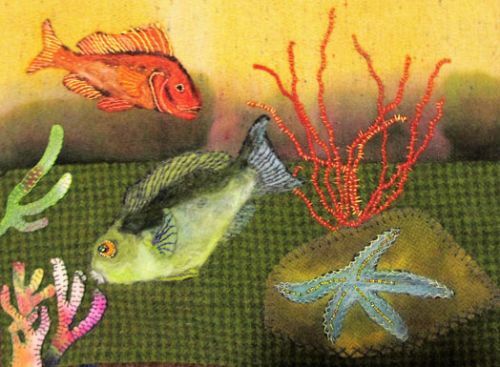 Embroidery can be used to sew the side fins in place and also be used for the lines of the other fins. 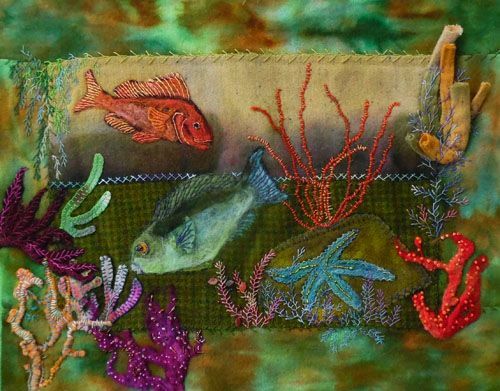 When you overlap the backgrounds you can felt them together, then add appliques or embroider something interesting over the seam like the sea fan or coral to make the whole quilt top exciting to look at. My quilt measures 37" wide x 41" long. 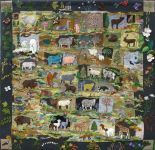 Your quilt could be much larger depending on how much time and effort you want to put into your quilt. There are 22 fish and a turtle, a seahorse, a starfish and an octopus in the pattern. The PDF pattern does not include the octopus because it was too large to print on a home printer. I didn't use the octopus in this quilt, anyway. I did some research on the seaweeds and coral at the New England Aquarium in Boston and included some of the details I saw there. I did make some smaller examples to practice on. My color story gelled when I simplified my end design. I had even planned to use a five-inch hand dyed border, but I didn't use it in the end to keep the design simple. I used Fairfield's craft size wool batting and loved the loftiness of it. The fish pop because of this loftiness, and because I only quilted the backgrounds. .I quilted the ocean on my home sewing machine, a Bernina 1230 which I bought in 1989, with Sulky's Blendables, cotton threads in space dyed colors. The backing and the binding are cotton quilt weight fabric. Close up photo for quilting.The quilt flattened out and the fish popped after quilting on my home sewing machine. The batting is wool and it really stayed fluffy. The batting and the binding is cotton. 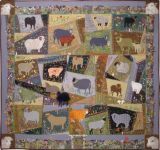 There are no rules about what fabric goes with a wool quilt. This photo was taken before the quilting. The backgrounds were a bit wavy. quilting made the quilt more interesting. This was one of the blocks that wasn't included in the quilt because the colors didn't work with the rest. 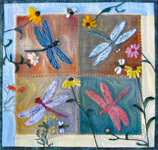 Here I've embellished this block a bit and added a border, so it can become a small wall quilt.